Did you know there are over 30 waterfalls in Maharashtra? While some are inaccessible to public during the monsoon, some are located at quite a distance from Pune. However, there are a handful of magnificent waterfalls that come to life, especially during the rainy season, perfect for one-day getaways and just a couple of hours drive from the city. Located about 156 kilometres away from Pune, the Randha Falls at Rajur in Bhandardara is a spectacular sight during monsoon. It’s a four-hour drive from Pune to Randha via the NH60 highway. Formed over the Pravara River, the Randha Waterfalls cascade down from a height of 170 kilometre in full force. One of the major sources for hydro power generation in the Bhandardara region, Randha Waterfalls can be best seen from a temple on the banks of the Pravara river. Bekare, a lesser-known waterfall situated amidst the Matheran range, at Bhivpuri in Karjat, just about two and a half hours from Pune. If you’re driving, take the Mumbai-Pune highway and head towards Karjat. Reach the base village of Bekare at Bhivpuri and get some breakfast. A 20-minute trek from the base village leads you to the top of the waterfall. What’s best about this place is that you can do a thrilling waterfall rappelling, down the length of Bekare, which is approximately 70-75 feet long. Situated 62km south west of Pune near Raigad district, Madhe Ghat Waterfall is a perfect monsoon one-day getaway amidst erstwhile forts, lush green hills and meandering rivers. The waterfall trek is a major tourist attraction here. It’s fairly simple since it completely descends down to a valley. On a fog-less day, you can also spot the Raigad Fort, Lingana, Varandha and the Shivthar Ghats from Madhe Ghat. 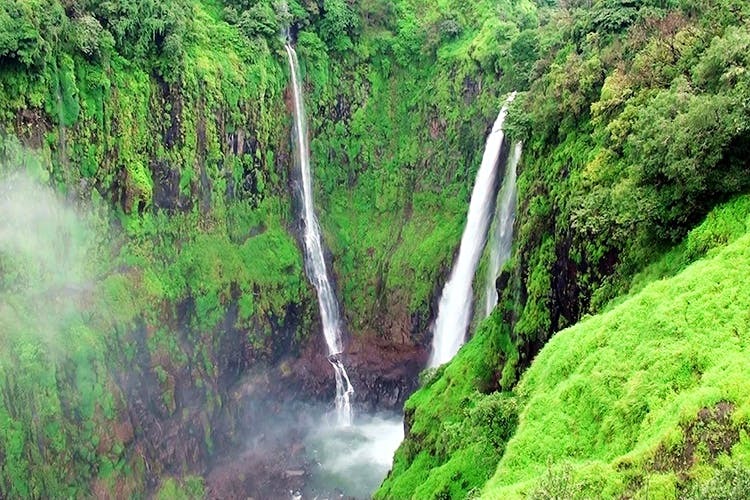 Located at the Thoseghar village in Satara district, this waterfall with a height of about 500 metres is one of the highest waterfalls in India. It’s a three-hour drive from Pune to Thoseghar via NH48. If you want to avail the public transport, take a morning train to Satara station. From there, you can take a bus to Thoseghar. It’s a seasonal waterfall, which means you can only witness Thoseghar during monsoon. There is no way you can enter the waterfalls, however, the area around it is serene and green that makes for a pleasant picnic spot for tourists. Located at the quaint village of Bhira in Maharashtra, catch a glimpse of the enticing crystal-clear Devkund waterfall, surrounded by green fields and hill ranges. You need to drive through Swargate-Chandi Chowk-Paud-Mulshi-Tamhini Ghats-Bhira to reach Devkund. The location is approximately 70km from Pune, therefore, the drive shouldn’t take more than two hours. Once you reach there, do take a dip in to the green-blue waters of Devkund. The place is quiet and untapped and also makes for a perfect romantic getaway with your partner.